Chapter 6: The Treatment of Old People: Cherish, Abandon, or Kill? After our first doubts about the quality of Diamond’s research in this book, we arrive at this chapter about the treatment of old people in primitive societies which I have found highly disappointing (I mean the chapter not the treatment). No, Mr Diamond, this is not a help-book about what to do with our old parents and if I want a suggestion about it I will email you when I will need it. The other part of the article, the one explaining the things the reader is expecting, offers us a description of cruel and barbaric methods of getting rid of old people, an overview of the utility of old people for primitive societies and some examples of methods to protect old people (food taboo, young women taboo, property rights). The author has tried to make a kind of logic of it all based on the idea of utility which turns out to be confusing. There are two different kind of things: what happens to people which are useful and what happens to people which are not useful any more. The examples of killing of old people correspond to not useful people. The logic of helping old people articulated next (including a desperate attempt to bring evolutionary biology to the game) is based on the assumption of utility. But the point is that there are civilizations (how frequent they are is something that I hoped the author would explain here) that take care of their useless old people much beyond the food taboo issue and property mechanisms. “Respect your parents” is one of the Commandments. Romans, the most lucky people in the history of the world, considered the they were favoured by Gods because the origin of Rome went back to the escape of Aeneas from Troy carrying on his arms his old father Anquises who could not walk any more: Rome was borne with an act of fundamental Piety. There is in our civilization a fundamental moral principle about respecting and taking care of the elderly. And Diamond doesn’t take it even into account. Is this unique to our civilization? Where this comes from? Nothing in this chapter. And again. Where are the references for the assertions of the book? I don’t feel at all satisfied with the idea that a civilization has the habit of burning alive their old people. Its absolutely counter-intuitive. I want to know where you got that information and to check it myself. To summarize, I find the chapter confusing, the author confused and most of its content out of subject. As a father of two little creatures of 5 and 2 years old, I was really looking forward for this chapter. Despite my initial observations about chapters being too long, I have to admit that I wish this one to be longer. Here the tone of the book changes,and we have a chapter focused on what can we learn from traditional societies. Diamond uses traditional societies as “a vast database of child-rearing.” that reveals “the outcomes of thousands of natural experiments on how to rear children”. These experiments are also being carried away in our Western world, as parents are not that happy with the way states think children should be educated, like people trying again to give children at home instead of hospitals. And some are starting to be implemented as pilot experiments. For example, in the school I send my children, next course instead of putting in a classroom 22 kids of the same age, they are going to mix ages from 6 to 10 years, so kids do not learn just from the teacher, but from other kids of other ages as well. The section on infanticide, of course, moves away from such tone, and we are shown how traditional societies do not have much options but to consider some forms of infanticide, besides some exceptions like the Siriono Indians in Bolivia. The same happens with child autonomy: it heavily depends on the environment. infants of hunter-gatherers under one year living in the Amazon rainforests “spend about 93 % of their daylight time in tactile contact with a mother or a father (…) it is not until about three years of age that Ache children between three and four years of age spend 76% of their daylight time less than one meter away from their mother.” And then, in mostly harmless environments like the Australian desert, children regularly go on foraging trips unsupervised y adults. – To stop using strollers, and carry babies horizontally and forward so there is physical contact between the child and the care-giver and infants and adults see the world from the same perspective. – Giving more opportunities to kids to be with their fathers and allo-parents (aunts, uncles, grandparents) and share education among them all. – To give kids more autonomy to explore, experiment with stuff and face the consequences of their behavior instead of over-protecting them. – To pay more attention to children crying instead of the behaviorist position of letting them cry. – To let children sleep with their parents at least till a certain age. – To develop games which are not based on competition or contest, but on cooperation and sharing. – To let children learn from adults and not separating play and education so drastically. – To let education in children follow naturally from social life. As usual, Diamond is careful about his conclusions. So far we got impressions, not hard science. It is very difficult to establish what are the reasons that generally make children in traditional societies more resilient, autonomous and empathic. But those impressions are relevant and an invitation to explore these natural experiments. To annihilate intellectually Monsieur Rousseau, King of Illuminati. The descriptive part is impressive. There is an initial presentation of methodological issues, definition of war, sources of information, problems related with every one of these sources, etc… that creates in the reader, once again, the feeling that we are dealing with somebody who really knows what he is talking about. And this is something that I more and more appreciate in these times of shallowness. We come to know the kind of tactics used in tribal warfare, more or less similar to modern times with some exceptions like that of the treacherous party. Think of how many billions of dollars would have Obama spared the US taxpayer just inviting Osama Bin Laden to a dinner and giving to him poisoned Orangina! But outside tactical issues. Traditional war happens to be a very different business from our wars. It is an almost continuous state of violence, which confronts face to face people who know each other. There is no discipline, no orders, death is always at short range, soldiers have to go back to their work because they are not professionals and, the most striking of all, it is a total war. There are no prisoners, no spared enemies, no occupied territories. The objective of war is the killing of every man, woman (sometimes they are taken as spouses), and children of the other group, the destruction of their houses and belongings (when they cannot be raided) and their total annihilation. And all this never ending violence comes, among other reasons, because there is not a powerful enough authority to end war and to force every one to stop violence. Implicit in all this thinking is the assumption that systems evolve following a citizen well-off criteria of selection. A modern anarchist would say, however, that this is non-sense. Systems evolve by natural selection by means of political units destroying each others using war, invasion, annexation, etc… and the selection criteria is the power to do so indifferently of the well being of the members of each model of political unit. Diamond’s argument is interesting and worth discussing and probably has truth in it but I think that there is much more in the process of creation and evolution of the state form of organization. I sympathize with scholars outraged by the mistreatment of indigenous peoples. But denying the reality of traditional warfare because of political misuse of its reality is a bad strategy, for the same reason that denying any other reality for any other laudable political goal is a bad strategy. (p. 153). I cannot agree more with him. Are we genetically inclined to violence? Yes, but also to cooperation and compassion. Humans have expanded to the whole planet as sparse groups of hunter gatherers. This groups have grown, improved their methods of production and then have begun to collide with one another and fight for limited resources. This is the origin of wars then and now. Some groups succeed by eliminating others till the final game with the European invasion of the World from the 15th century on. This is probably the chapter in which the average “alternative” reader leaves the book aside, his expectations shattered. Instead of a rosy picture of the good savage, we are introduced to the inherent, chronic violent territorial actions of traditional societies, something you don’t want to return to for sure. One of the two succeeded in fleeing, but the other was overpowered and killed. As Wilihiman men dragged off the dying Asuk-Balek, young boys ran alongside him, piercing his body with tiny spears. 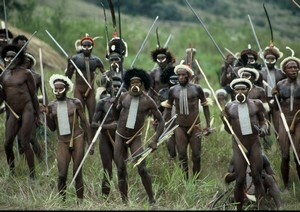 The killing triggered wild rejoicing and singing everywhere among the Wilihiman, followed by a celebratory dance. Anything we can learn from that? In this chapter, Diamond describes a war between groups in New Guinea that has been profusely documented. The image we get from it about traditional societies is not very gentle: Ambushes and open battles, massacres and exterminations, violence among people that are members of the same tribe and speak the same language, boys trained to fight in childhood, and the belief that the enemy is not really human. To make things more depressing, this raw violence is combined with plain inefficiency, and we discover that the main reason that wars in traditional societies are not more lethal is just because military are very disorganized, and possess only not so harmful technologies. Wars do no have clear-cut causes, they are chronic and can be activated by the stealing of a pig. The weather is also key and a a battle can be cancelled if the parts consider there is a meaningful probability of heavy rains. The relative death toll of the Dani War— the number of Dani killed as a proportion of the total population involved— rivaled or eclipsed the casualty rates suffered by the U.S., European countries, Japan, or China in the world wars. For example, the 11 deaths suffered by the two Dani alliances on the Gutelu southern front alone, in the six months between April and September 1961, represented about 0.14% of the alliances’ population. That’s higher than the percentage death toll (0.10%) from the bloodiest battle on the Pacific front during World War II: the three-month struggle for Okinawa, employing bombers and kamikaze planes and artillery and flame-throwers, in which about 264,000 people (23,000 American soldiers, 91,000 Japanese soldiers, and 150,000 Okinawan civilians) died […] The 125 men, women, and children killed within an hour in the Dani massacre of June 4, 1966, represented about 5% of the targeted population (about 2,500), the southern confederations of the Gutelu Alliance. To match that percentage, the Hiroshima atomic bomb would have had to kill 4,000,000 rather than 100,000 Japanese, and the World Trade Center attack would have had to kill 15,000,000 rather than 2,996 Americans. As we are getting used to, some parts are very verbose, and it is difficult to see the point, like in the detailed description of the two alliances at war, the Gutelu and the Widaia. This chapter clearly falls in the “Thanks God I don’t live in a traditional society” and I found it both informative and entertaining.